Cut off the stalk end to form a lid, on approximately 12 same-sized tomatoes. Remove the inside of the tomatoes with a spoon and put into a separate bowl. Put cooking fat and thinly sliced onions in a pan, saute until the color of the onions change. Wash rice and add it to the onions, add water and close the lid of the pan and cook for about 10 minutes over moderate heat. Remove from heat, add ground meat , chopped dill, black pepper and 1/2 teaspoon salt, mix for about 5 minutes. 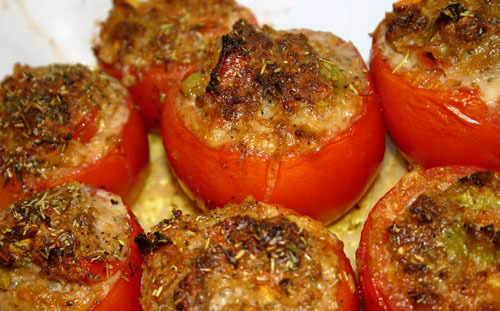 Take the insides of only 5 of the tomatoes, chop small and add that to the filling and mix. Stuff the tomatoes, replace the lids and place in a pan. Add margarine, 1/2 teaspoon of salt and 1 1/2 glasses water; close the lid and cook on moderate heat for about 30-35 minutes. Place on a serving dish and serve.